The arrival of spring in Minnesota brings joy and excitement for people of all ages. We all love to get outdoors after being inside during the cold winter months. One great outdoor activity that is fun for the whole family is biking. Biking offers freedom and exercise and it’s an entertaining activity to do as a family. But before you hit the roads to enjoy the great outdoors, make sure you and your family are being safe. Wear a helmet: A helmet is the most effective safety device to reduce head injury and death from bicycle crashes. Find the right helmet fit: Make sure your child has the correct size helmet and they wear it every time they are riding their bike, skating or scooting. Let your child pick out their own helmet when it’s time to purchase a new one. They will be more likely to wear it if they helped pick it out. Make eye contact with drivers: Bikers should make sure drivers are paying attention and are going to stop before they cross the street. Rules of the road: Always ride your bike on the right side of the road, with traffic, not against it and stay as far right as possible. Use appropriate hand signals and respect traffic signals, stopping at all stop signs and stoplights. “Kids learn from watching their parents, so it’s extra important for parents to model proper safety behavior. Always wear a helmet when biking no matter the distance. Not only could it save your life but the life of your child,” states Dr. Jeff Elder, Medical Director of the Emergency Care Center at Maple Grove Hospital. Did you know? More children ages 5 to 14 are seen in emergency rooms for bike related injuries than any other sport. 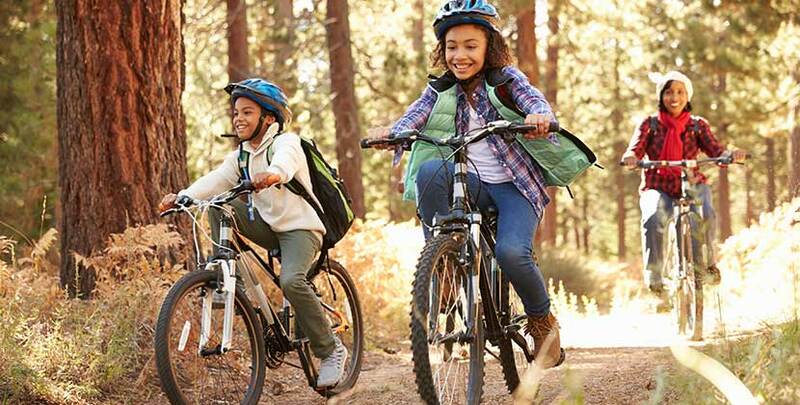 Helmets can reduce the risk of severe head injuries by 88 percent – yet only 45 percent of children 14 and under typically wear a bike helmet, according to Safe Kids Worldwide.